A custom reusable bag lets you put your creativity and marketing message on display while establishing or reinforcing your brand. There are so many ways you can customize the design of one of our stock bags or if you have big ideas you can really let loose and design a completely unique bag that fits your vision. Whatever you decide we are here to help. When you get a branded reusable bag into your customer’s hands, they will essentially turn into mobile billboards, and they’ll promote your brand each and every time they carry and use your branded bag. Reusable bags are a smart marketing tool because people clamor to get them, so if you feature a custom branded reusable bag as a tradeshow takeaway for instance, people will be lining up to get one…people will be lining up to promote your brand. 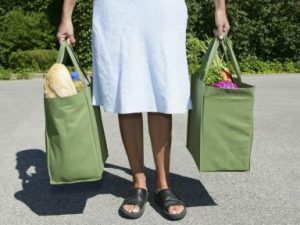 With the popularity of disposable bag bans reusable bags are becoming even more sought after, but even in areas without any laws regulating single-use plastic bags reusable bags are still very popular. Reusable bags are an item that appeals to most people, have wide-ranging reach and last for a significant amount of time, ensuring your branding will be in place for years to come. Our reusable bags reach thousands of companies, they green millions of consumers, and that’s how change begins. A reusable bag will last for about 6 years, so over that period of time one person carrying a branded bag can reach thousands of existing and potential customers, vendors, competitors and more, putting your marketing info front and center. The more reusable bags you distribute the more exposure your brand will get and the more awareness and buzz there will be around your company and the products or services you provide. If you make the decision to market your brand with a customized bag we are super excited and look forward to working with you. Head here and walk through this simple four step process to designing your customized bag. Start out by selecting the size and material, choose the color and what embellishments and extra features you want to build in, and lastly get us your info. We’ll review your design, follow up with answers to any questions you may have and send you a quote; and you’ll be well on your way to spreading the word about your brand.